A brief history of how the Southeast Asian nation came to be one of the world’s most attractive destinations for software outsourcing. In the late 1990s, the software industry began to undergo a radical change. Thanks to rapidly improving telecommunications technology, it finally became possible to shift large-scale IT operations to low-cost countries, primarily in Asia. Within a few years it no longer seemed unusual for a client in London to speak with a customer service representative in Bangalore, at any hour of the day. Offshoring in this manner, which required companies to set up their own dedicated centers in the low-cost countries, occasionally proved problematic. Since (primarily) Western businesses had little familiarity with (primarily) Asian nations and their business practices, many challenges had to be overcome before offshoring became a truly lucrative endeavor. Some nimbler companies managed to avoid these problems entirely by utilizing the next stage of offshoring development. Today we are familiar with this concept as “outsourcing”, but at the time it seemed uncertain whether third-party companies in low-cost countries could produce products and services on par with their more expensive Western counterparts. In 2015, this question has been answered with an authoritative “yes”. Now, it is rare for large companies not to delegate large portions of their noncore operations to contracted vendors in low-cost countries. Small and medium businesses are beginning to follow suit as well, as communications and production technologies continue to improve. As outsourcing becomes easier and more cost-effective, the benefits are beginning to be realized by savvy companies of all sizes. Where are the most cost-effective outsourcing vendors located, and what criteria can be used to identify them? In recent years, Vietnam has emerged as an attractive location for outsourcing. Due to rapid economic development and an increasingly progressive view toward foreign investment, the country now boasts many advantages compared to traditional outsourcing hotspots such as India. Many forward-thinking organizations are already taking advantage of this, a trend that is likely to continue as new data emerges to support the anecdotal evidence. 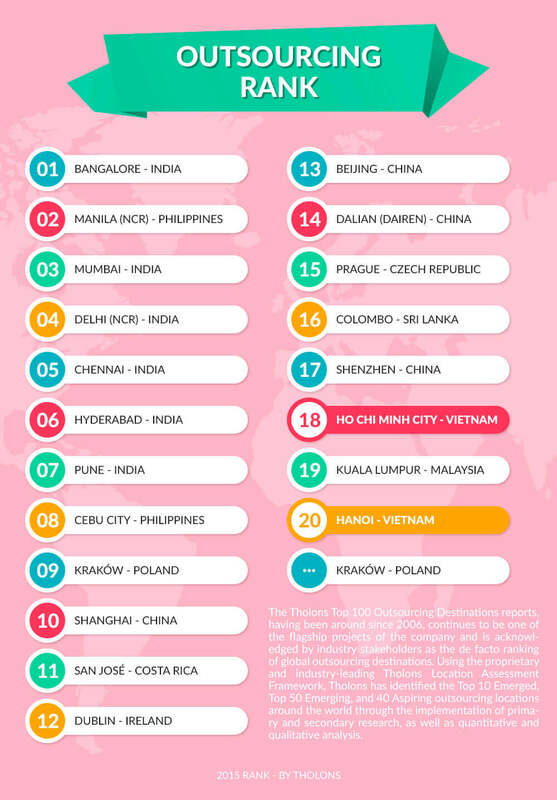 According to the 2015 Tholons Top 100 Outsourcing Destinations report, Vietnam now has two of the top twenty cities for outsourcing. Both Ho Chi Minh City and Hanoi have steadily risen through the rankings in the recent past, now outpacing traditional heavyweights such as Kolkata and Guangzhou. Industry stakeholders generally accept the Tholons report, which relies on the company’s propriety Tholons Location Assessment Framework, as a de facto ranking of global outsourcing destinations due to its use of primary and secondary research to provide quantitative and qualitative analyses. The Tholons report identifies a two-pronged stimulus for the rise in outsourcing in the recent past: access to a larger talent pool and cost arbitrage. With a population of over 90 million people, an increasing percentage of who are young and university-educated, Vietnam is home to one of the most fertile talent pools in the Asia-Pacific region (often regarded as the most attractive area of the world for outsourcing). And, as a country in which a hearty dinner usually costs less than $3USD, costs in Vietnam are still much lower than many of the more well known outsourcing destinations. The 2014 A.T. Kearney Global Services Location Index (latest available) paints a similarly positive picture of Vietnam’s place in the global outsourcing market. The index ranks countries according to three primary criteria: financial attractiveness, people skills and availability, & business environment. 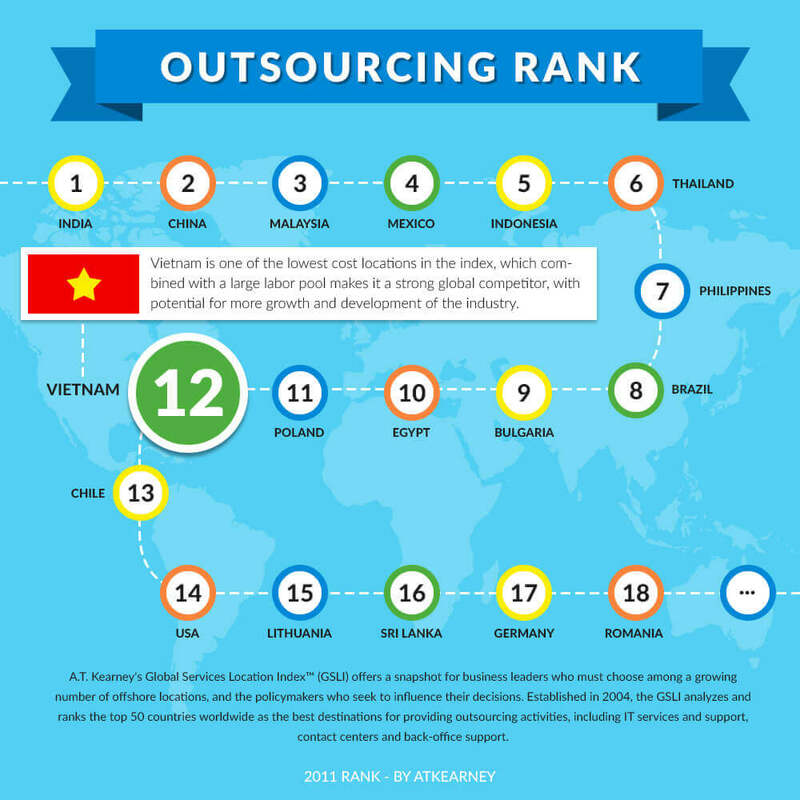 With a cumulative score of 5.54, Vietnam ranks as the 12th most overall attractive destination for outsourcing, according to the A.T. Kearney index. It was also the 4th ranked country in terms of financial attractiveness, bettering the scores of India, China, and Malaysia (the top three overall destinations). As Vietnam’s available talent pool continues to expand, and the country opens itself further to foreign business partners, it will not be surprising to see the country make even greater strides upward in the future. Anyone who has visited Vietnam in recent years can testify that the country is entering an exciting new stage of development, one that may very well see it emerge as an equal rival of its more famous neighbors to the north and west. The Southeast Asian nation, long romanticized as the land of beautiful women in conical hats strolling through verdant green rice paddies, is now a rapidly modernizing economic force. In the past few years, many of the world’s most successful businesses have begun to appreciate Vietnam as a land of untapped promise, as the country’s iPhone-loving, Starbucks-sipping young people will cheerfully attest. For now, Vietnam exists in that most exciting and lucrative of states – capable yet underappreciated, the unicorn of software outsourcing destinations. Except in Vietnam’s case, the reports have already been confirmed.